The single most threatening species to U.K.’s biodiversity is a species of mussels – the quagga mussel. Coming from the Black Sea and the Caspian Sea in Eastern Europe, the quagga mussel came with four other freshwater invaders which have now become a huge danger for Britain’s wildlife. Quagga mussels. Image via 100th Meridian. The quagga mussel, scientific name Dreissena rostriformis bugensis, is an invasive species. It is highly adaptive, can thrive in many different conditions and can push out the local wildlife, making way for its own species. The quagga mussel was first observed in North America in September 1989 when it was discovered in Lake Erie near Port Colborne, Ontario, where it also caused a significant loss of wildlife. It’s believed that these mussels travel on the bottom of ships or in the ballast water they use. Quaggas are prodigious water filterers, removing substantial amounts of phytoplankton and suspended particulate from the water. By removing the phytoplankton, they take out the zooplankton’s main food source – and in turn, affect the entire lifecycle of the area. Each coin-sized quagga can filter up to a liter of water per day, stripping away the plankton that basically supplies the entire food chain. Furthermore, Dreissena has the ability to rapidly colonize hard surfaces, which makes it even more threatening. They can also can clog water intake structures, such as pipes and screens, therefore reducing pumping capabilities for power and water treatment plants. They can also, to some extent, damage boat and harbor structure. 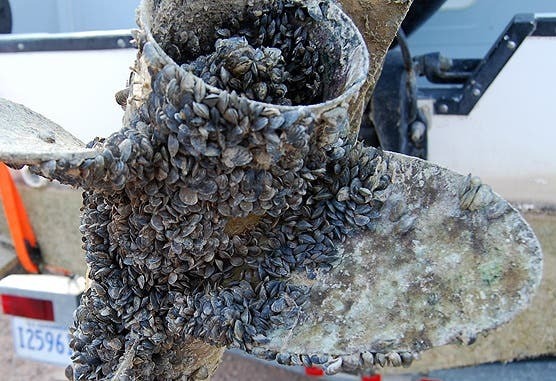 A propeller completely covered by quagga mussels. Image credits: Idaho.gov. 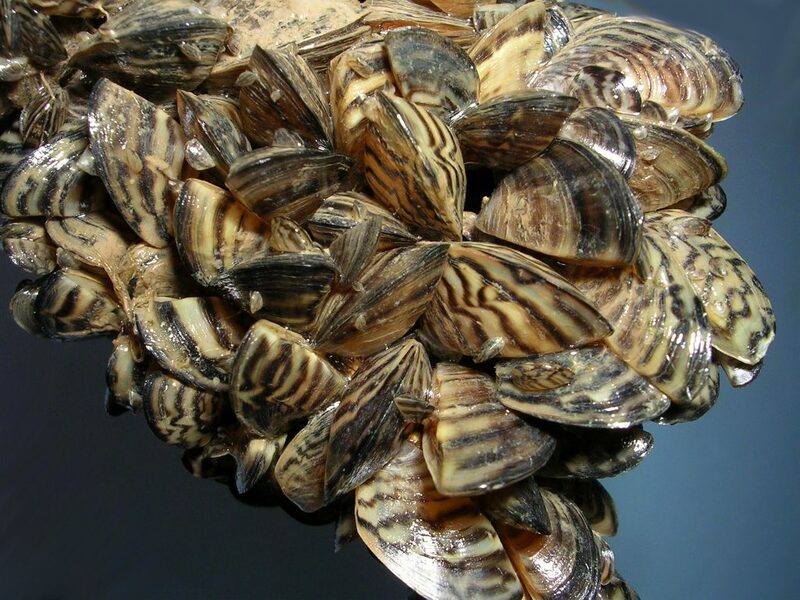 In a new research study, published in the Journal of Applied Ecology, researchers from the University of Cambridge analyzed the most dangerous invasive species in the U.K., and rather surprisingly found that the quagga (the mussel, not the actual quagga which is now extinct) tops that list; and it’s not just biodiversity which is threatened – a reservoir near London Heathrow Airport is also in danger of being ruined. According to a Defra spokeswoman, the cost of the economy that is being threaten by the Quagga mussels amount to 1.8 billion pound a year. But should the invasion spread, then the risk would be huge – virtually every bit of freshwater and wetland can be threatened. “Pretty much everything in our rivers and lakes is directly or indirectly vulnerable,” said Dr David Aldridge, co-author from the University of Cambridge’s Department of Zoology, who confirmed the quagga find. “The invader we are most concerned about is the quagga mussel, which alarmingly was first discovered in the UK just two weeks ago. This pest will smother and kill our native mussels, block water pipes and foul boat. But it gets even better. Also on that invasive species list is the killer shrimp – dubbed the ‘pink peril’. 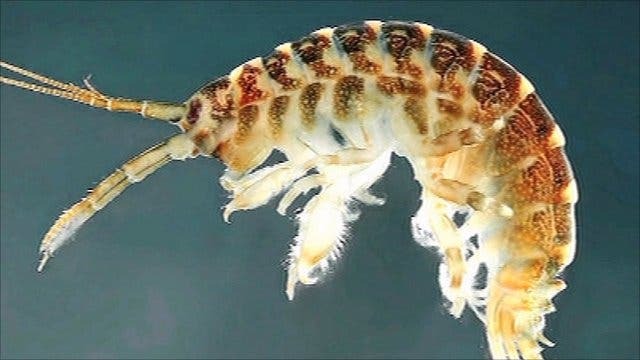 The killer shrimp’s favorite food is (you’ve guessed it) the quagga mussel – so having huge numbers of quagga mussels will lead to huge numbers of killer shrimps, which will further wipe out the endemic ecosystem, and will further pave the way for other species such as the goby fish. The goby fish haven’t been spotted in the UK yet, but it seems like just a matter of time before that happens. The rate at which the ecosystems are changing is certainly alarming. There are other examples, such as the Netherlands which show just how drastic this change can be – their marine ecosystems are practically unrecognizable now. ‘If we look at The Netherlands nowadays it is sometimes hard to find a non-Ponto-Caspian species in their waterways.’, said Dr Aldridge. The Killer Shrimp is also an invasive species; among its favorite food is the quagga mussel. A growing quagga population will lead to a growing shrimp population which will alter the ecosystem even more. Image via Superzoo. Dates and locations of the first British reports of 48 other freshwater invaders from around the world show that 33% emerged in the Thames river basin, making it the UK hot spot for invaders, followed by Anglian water networks (19%) and the Humber (15%). The main cause for this invasion is, if not exclusively than certainly decisively, human activity. The fact that we are transporting things from one place of the world to another seems to inevitably lead to a transport of unwanted invasive species. “Due to globalisation and increased travel and freight transport, the rate of colonisation of invasive species into Britain from The Netherlands keeps accelerating – posing a serious threat to the conservation of British aquatic ecosystems,” said co-author Dr Belinda Gallardo, now based at the Doñana Biological Station in Spain.